I experimented on another recipe using cassava. 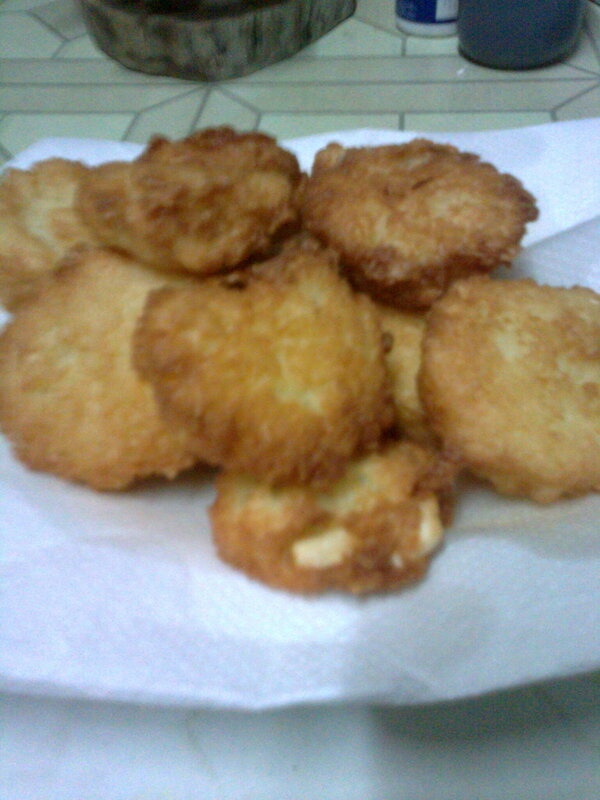  It’s called Cassava Nuggets. 1. Beat eggs and add cornstarch, salt, pepper and garlic. 2. Add grated cassava. Mix well. 3. Scoop a spoonful of mixture and deep fry until golden brown. 1. Dissolve cornstarch in water. 3. On low fire, add dissolved cornstarch, sugar, salt and pepper and cassava. Mix until it thickens. Sauce should give a sweet salty taste and coffee brown in color. Last Sunday, my friends and I went crazy over cassava and experimented on two cassava recipes: Okoy Cassava and Cassava Cake. 1. Combine cassava, papaya, onion and garlic. Add salt and pepper to taste. Set aside for 30 mins – 1 hour to allow ingredients to mix. 2. Beat eggs and fold into mixture. 3. Heat pan and oil. 4. Create small patties and deep fry into oil until golden brown. 5. Serve with chili-vinegar on the sides. 1. Dissolve sugar in coconut milk. Add condensed milk and evaporated filled milk. 2. Add grated cassava to the mixture. Mix well. 3. Using Chefel pan, fill ¾ of the pan with the cassava batter. 4. Let it steam for about 15 minutes. Flip pan and add butter on top. 5. Cook again for another 15 minutes. Flip pan again and add butter. We weren’t able to get actual photos of the whole activity because we got busy cooking and checking on the cake. It ended up well and everyone enjoyed the meal. Next time, we will try making homemade churros and cassava patties.